First Sentence: It was Ali Massoudi who unwittingly roused Gabriel Allon from his brief and restless retirement: Massoudi, the great Europhile intellectual and free thinker who, in a moment of blind panic, forgot that the English drive on the left side of the road. 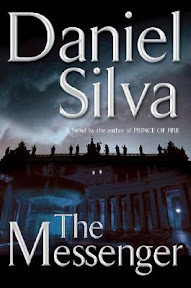 Reason for Reading: I have heard great things about Daniel Silva’s spy novels and when I saw this book up for review on Curledup.com, I decided to give it a try. Comments: When fate plays a hand in ending the life of a possible terrorist recruiter, information of a planned attack on the Vatican and the threat of the assassination of the pope fall into Israeli hands. The special security advisor to the Prime Minister of Israel, Ari Shamron, seeks out the help of the best man for the job, his old friend and one time recruit, Gabriel Allon. Gabriel seeks a conference with the pope’s private secretary, Monsignor Luigi Donati, a long time friend, in hopes of thwarting the attack on the pope and the Vatican. As events unfold and the stakes rise higher, it soon becomes clear that the terrorist web runs wide and deep. The leader of the terrorist group called the Brotherhood of Allah is believed to be Ahmed bin Shafiq, a former employee General Intelligence Department, Saudi’s intelligence service. At the request of the CIA and his own government, Gabriel assembles a team together to penetrate the heart of the organization believed to be hiding the Shafiq, a feared and most evasive man. It is not an easy undertaking for it is believed that Shafiq has the protection of a wealthy and powerful Saudi businessman called Abdul Aziz al-Bakari, or Zizi as his friends call him. Gabriel will need someone special if he is to infiltrate the organization, as Zizi is sure to recognize an Israeli plant. Gabriel Allon turns to American, Sarah Bancroft, a failed CIA candidate for help. She is beautiful and intelligent. Her background as an art curator proves to be just the ticket Gabriel needs to lure in Zizi and hope he will take the bait. From there on out, the novel offered nonstop suspense. Daniel Silva captures the volatile political climate of today, delving into the economic resources of terrorists, the Saudi’s influence on America, global terrorism and Islamic fundamentalism. Although slanted in favor of the Israelis (difficult not to do considering who the lead character is), the author does offer differing views on the approach to terrorism through the eyes of his many characters. This offers a much-required balance. Favorite Part: I love the character of Gabriel Allon. I hope to read earlier books in the series so that I can better get to know him. My favorite part of the novel was the point in which Gabriel and his team are training Sarah Bancroft for the mission and getting everything in place. I found myself holding my breath, waiting to see if they could pull it off. Miscellaneous: This book reminded me of the movie Munich. Maybe I should go out and rent it. We did catch two movies in the theater recently: Stranger Than Fiction which is a must see. I really enjoyed that one. It’s a drama with some humor mixed in for good measure. Very good story. The other movie we watched was the comedy Borat that seems to be attracting a lot of attention—and lawsuits. Just about everyone from every walk of life was made fun of in that movie. Hi! I found you through Literary Cache's TBR Challenge. Do you mind if I link you? Hi, Joy! I do not mind at all. I have been thinking of adding some of the blogs I frequently visit. I enjoy the easy access lists like that provide on the blogs that have them. If it's okay, I'll add you to my list when I do get one up. Good luck in the TBR Challenge! I'm really looking forward to it. Great! I'll add you on. :) I'd be honored to be on your list when you get it up and running. Twelve books off the TBR list will be a good thing.